Artist inspiration and artist influences. No biographies, dates or scholarly research here - this is a personal response to the work of Thelwell by Australian artist Fiona Morgan. Once upon a time I was a horse mad girl without a horse. That changed, as in I got a horse, and then changed again to bring you up to now where I have neither horse nor huge interest in horses anymore, though I am still fond of them. So back to the horse mad era. While I was afflicted with this madness and still horseless I read every single book on horses and ponies that our local library had. Every. Single. One. Many of them were awful. Some of them were pure gold. 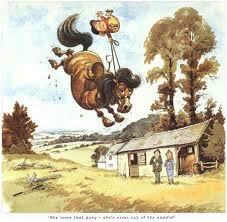 Thelwell's books probably gave me more insight into the horse world than any other source. He really nailed the characters of ponies and their riders and he could really, truly draw. 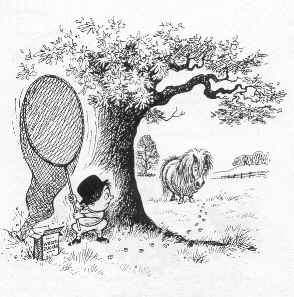 While I began reading Thelwell's books from a horse mad perspective, I kept reading them because this was a person who really knew how to observe humans and animals and the zany things we get up to, and then tease out just how silly we are being so that we laugh at ourselves. It really stayed with me that he could capture the essence of a situation and tell a story with a few well placed lines and an observant, witty mind. I think this is what I enjoy about cartooning. There is no human photocopier in sight (those artists who just copy slavishly and emotionlessly). There is no extraneous detail. What I learned from reading Thelwell is that expressions, movement, energy and imagination are the things to focus on capturing in art. It's your interpretation that people are looking for, and in Thelwell's case, humour was his interpretation of what he saw and people loved his work for this exact quality. 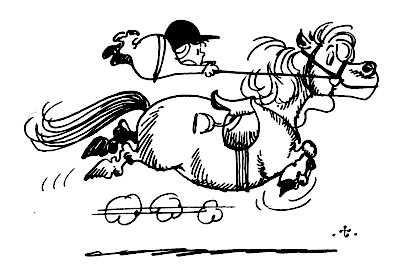 Thelwell is best remembered for his fat ponies and their long-suffering young riders, but he was a wide-ranging artist, who tackled many subjects for many papers and magazines, including Punch, with which he developed a close relationship over 25 years. He had a strong understanding of the British character, and may be considered the post-war heir to Pont of Punch. From estate agents to battery farmers, hunt protesters to harassed motorists, Thelwell chronicled the minutiae of our (British) lives. An accomplished landscape painter, Thelwell produced detailed, naturalistic settings for lively, comic figures that represent what he called, “the endearing lunacy of human behaviour”.